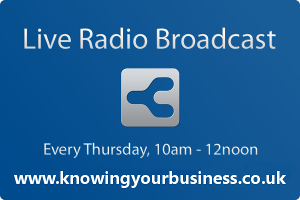 Our last show for 2013 is one of our most popular topics and that’s our open show format where we talk with different business sectors. This week we discuss using comedy to win business, changing banks for the best interest rates, and the hottest topic of the last few years, digital marketing. The Knowing Your Business team interview Jan Jack, Giles Andrews and Mark Tillison to find out more. Show time every Thursday from 10am until 12 noon. Jan Jack explains why humour in Business is worthy of your attention. Jan is a.Theo Paphitis small business Sunday (also known as SBS) & Jacqueline Gold WOW Winner. Stand up Stand out was started because Jan was advised to see what else she could offer people. As a comedian Jan realised she could help people put appropriate humour into their presentations – which really engages audiences.. Consultant to BBC South Stand Up if you Dare project 2013. Will interest rates make any difference to a nation of apathetic savers? We ask Giles Andrews. Giles is Zopa CEO and Co-Founder. Spent the first ten years of his career pursuing all things automotive. This included co-founding Caverdale in 1992, a start-up taken to a £250m revenue motor retailer, renamed Godfrey Davis Motor Group and sold in 1997. He then set up his own consultancy business whose clients included Tesco and Tesco Personal Finance and which also provided start up advice and early stage funding for new businesses, until co-founding Zopa in 2004. Digital Marketing is one of the hottest topics around in the business world, we find out why with Mark Tillison. Mark is the Managing Director of Tillison Consulting Limited. Experienced business development strategist with a wealth of campaign implementation and management experience with strong vision and the passion and persistence to create opportunities. Tillison Consulting is at the vanguard of the digital marketing industry. Founded in 2007, Tillison Consulting has evolved into a mutli-faceted digital marketing agency which now manages over £3 million in online paid advertising. Specialising in SEO, PPC and Social Media, Tillison Consulting has helped hundreds of businesses improve their search engine ranking, customer engagement and lead generation over the last 5 years. I heard Jan Jack talk recently at the Banbury Women in Business Awards. Highly amusing and not to be missed! Thanks Michelle. Jan was indeed a star.